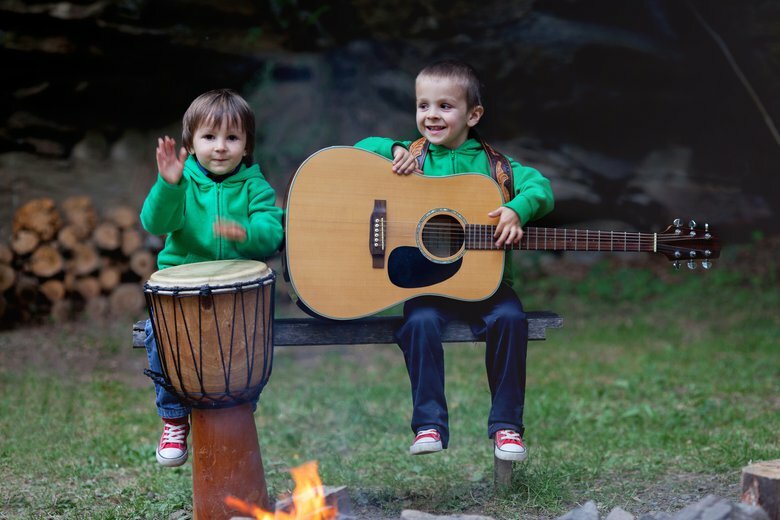 Camp songs help build camping spirit, let the kids loosen up and make great memories. The best part about camping songs is that you don't have to worry about staying on key. You don't need a guitar to accompany you either, although it can help. But to get everyone singing together, you have to pick the right song. Most camp songs for kids are ones that children already know with a repetitive chorus. "Repeat After Me" camp songs are popular. The leader of the group calls out a line from the song and the rest of the group repeats it back. If you are introducing a new song to the group, using this style is a great way to help campers learn the lyrics and actions. Action songs also work to get the kids involved. Any camp song can be an action song -- just add some arm motions! Get your kids to help create the motions. Another type of camp song is one sung in a round. Everyone sings the same melody and lyrics but starts at different times. Separate kids into two or more groups and have one group sing the first verse before the next group starts the song. Rounds are fun and a great way to build camaraderie with the others singing your part. Many popular camp songs are classics that have been around forever. Many songs are historically based while others are just plain silly. With kids being your audience, the sillier the better. So gather around the campfire and sing loud and proud and just have some fun! Stephanie Glover is the writer and photographer behind A Grande Life. When she doesn't have her camera in her hands, you'll find her with a cup of coffee.